The FLOW-3D simulation below shows air bubble generation in a simple co-flowing micro channel. Water and air enter the microchannel from the same side (left), separated by a barrier. There are two steps in the bubble formation process. First the gas phase expands downwards and horizontally until a neck is formed, then the neck propagates downstream and its diameter decreases until it finally breaks. In the simulation results above, blue denotes the gas (air) phase and red denotes the liquid (water) phase. 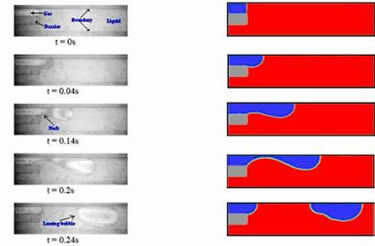 Experimental results taken from Renqiang Xiong, Mo Bai, Yun Whan Na, Jacob N Chung, “Bubble generation in the micro-channel with a barrier,” Proceedings of FEDSM2007 5th Joint ASME/JSME Fluids Engineering Conference July 30-August 2, 2007 San Diego, California USA.